This interview was conducted in 2002 on the original publication of Heat Wave. Question: Take us back to July 1995 in the city of Chicago. How hot was it? What were the city and its residents going through? Klinenberg: Chicago felt tropical, like Fiji or Guam but with an added layer of polluted city air trapping the heat. On the first day of the heat wave, Thursday, July 13, the temperature hit 106 degrees, and the heat index—a combination of heat and humidity that measures the temperature a typical person would feel—rose above 120. For a week, the heat persisted, running between the 90s and low 100s. The night temperatures, in the low to mid-80s, were unusually high and didn’t provide much relief. Chicago’s houses and apartment buildings baked like ovens. Air-conditioning helped, of course, if you were fortunate enough to have it. But many people only had fans and open windows, which just recirculated the hot air. The city set new records for energy use, which then led to the failure of some power grids—at one point, 49,000 households had no electricity. Many Chicagoans swarmed the city’s beaches, but others took to the fire hydrants. More than 3,000 hydrants around Chicago were opened, causing some neighborhoods to lose water pressure on top of losing electricity. When emergency crews came to seal the hydrants, some people threw bricks and rocks to keep them away. The heat made the city’s roads buckle. Train rails warped, causing long commuter and freight delays. City workers watered bridges to prevent them from locking when the plates expanded. Children riding in school buses became so dehydrated and nauseous that they had to be hosed down by the Fire Department. Hundreds of young people were hospitalized with heat-related illnesses. But the elderly, and especially the elderly who lived alone, were most vulnerable to the heat wave. After about forty-eight hours of continuous exposure to heat, the body’s defenses begin to fail. So by Friday, July 14, thousands of Chicagoans had developed severe heat-related illnesses. Paramedics couldn’t keep up with emergency calls, and city hospitals were overwhelmed. Twenty-three hospitals—most on the South and Southwest Sides—went on bypass status, closing the doors of their emergency rooms to new patients. Some ambulance crews drove around the city for miles looking for an open bed. Hundreds of victims never made it to a hospital. The most overcrowded place in the city was the Cook County Medical Examiners Office, where police transported hundreds of bodies for autopsies. The morgue typically receives about 17 bodies a day and has a total of 222 bays. By Saturday—just three days into the heat wave—its capacity was exceeded by hundreds, and the county had to bring in a fleet of refrigerated trucks to store the bodies. Police officers had to wait as long as three hours for a worker to receive the body. It was gruesome and incredible for this to be happening in the middle of a modern American city. Question: How many people died as a result of the heat wave? Klinenberg: In 1995 there were no uniform standards for determining a “heat related death,” so officials had to develop them. Edmund Donoghue, Cook County’s chief medical examiner, used state-of-the-art criteria to report 465 heat-related deaths for the heat wave week and 521 heat deaths for the month of July. But Mayor Richard M. Daley challenged these findings. “It’s hot,” the mayor told the media. “But let’s not blow it out of proportion.… Every day people die of natural causes. You cannot claim that everybody who has died in the last eight or nine days dies of heat. Then everybody in the summer that dies will die of heat.” Many local journalists shared Daley’s skepticism, and before long the city was mired in a callous debate over whether the so-called heat deaths were—to use the term that recurred at the time—“really real." Medical examiners around the country confirmed that Donoghue’s heat-related death criteria were scientifically sound and endorsed his findings. But perhaps the best measure of heat deaths comes from another figure—the “excess death” rate—which counts the difference between the reported deaths and the typical deaths for a given time period. According to this measure, 739 Chicagoans above the norm died during the week of 14 to 20 July—which means that Donoghue had been conservative in his accounts. Daley’s skepticism had a big impact on the public debate, and it still does. Today if you ask Chicagoans about the heat wave they will likely tell you that not all the deaths were “really real.” That’s a direct legacy of the politics of the disaster. Question: Who were these 739 people? Was there a “typical” victim? Klinenberg: The US Centers for Disease Control and Prevention did a thorough study of individual-level risk factors for heat wave victims, and they came up with a list of conditions of vulnerability: living alone, not leaving home daily, lacking access to transportation, being sick or bedridden, not having social contacts nearby, and of course not having an air conditioner. Given these factors, experts assumed that female victims would outnumber male victims in the heat wave deaths, because women are more prevalent among those who are old and who live alone. But in fact men were more than twice as likely to die as women. This is just one of the surprises that emerged during my study of the Chicago heat wave. To understand this we have to look at the social relationships that elderly women retain but that elderly men tend to lose. The ethnic and racial differences in mortality are also significant for what they can teach us about urban life. The actual death tolls for African Americans and whites were almost identical, but those numbers are misleading. There are far more elderly whites than elderly African Americans in Chicago, and when the Chicago Public Health Department considered the age differences, they found that the black/white mortality ratio was 1.5 to 1. Another surprising fact that emerged is that Latinos, who represent about 25 percent of the city population and are disproportionately poor and sick, accounted for only 2 percent of the heat-related deaths. I wrote Heat Wave to make sense of these numbers—to show, for instance, why the Latino Little Village neighborhood had a much lower death rate than African American North Lawndale. Many Chicagoans attributed the disparate death patterns to the ethnic differences among blacks, Latinos, and whites—and local experts made much of the purported Latino “family values.” But there’s a social and spatial context that makes close family ties possible. Chicago’s Latinos tend to live in neighborhoods with high population density, busy commercial life in the streets, and vibrant public spaces. Most of the African American neighborhoods with high heat wave death rates had been abandoned—by employers, stores, and residents—in recent decades. The social ecology of abandonment, dispersion, and decay makes systems of social support exceedingly difficult to sustain. Question: So would you call the heat wave deaths primarily a social disaster, rather than a natural one? Klinenberg: Of course forces of nature played a major role. But these deaths were not an act of God. The authors of an article in the American Journal of Public Health said that the most sophisticated climate models “failed to detect relationships between the weather and mortality that would explain what happened in July 1995 in Chicago.” Hundreds of Chicago residents died alone, behind locked doors and sealed windows, out of contact with friends, family, and neighbors, unassisted by public agencies or community groups. There’s nothing natural about that. The death toll was the result of distinct dangers in Chicago’s social environment: an increased population of isolated seniors who live and die alone; the culture of fear that makes city dwellers reluctant to trust their neighbors or, sometimes, even leave their houses; the abandonment of neighborhoods by businesses, service providers, and most residents, leaving only the most precarious behind; and the isolation and insecurity of single room occupancy dwellings and other last-ditch low-income housing. None of these common urban conditions show up as causes of death in the medical autopsies or political reports that establish the official record for the heat disaster. Chicago had such a high mortality rate because it is, as Mayor Daley quipped during the heat wave, the classic American city of extremes. It is a city of great opulence and of boundless optimism, but—as William Julius Wilson says—Chicago also suffers from an everyday “emergency in slow motion” that its leaders refuse to acknowledge. The heat wave was a particle accelerator for the city: It sped up and made visible the hazardous social conditions that are always present but difficult to perceive. Yes, the weather was extreme. But the deep sources of the tragedy were the everyday disasters that the city tolerates, takes for granted, or has officially forgotten. Question: What about the response from the city? Did the city government do enough to warn residents of the danger, provide cool shelter, or help people who were in trouble? What could Chicago do differently in future heat waves? Klinenberg: It is not fair to blame any single organization or individual for an event in which hundreds of people die alone. The heat disaster was a collective failure, and the search for scapegoats—whether the mayor, the media, or the medical system—is just a distraction from the real issues. Yet there is no question that the city government did not do everything it could to prevent the catastrophe. The city failed to implement its own heat emergency plan, waiting until Saturday, July 15, after hundreds of bodies had already been delivered to the county morgue, to declare an official emergency. The Fire Department refused its paramedics’ requests to call in more staff and secure more ambulances, thereby assuring continued delays in its emergency health response. The Police Department did not use its senior units to attend to the elderly residents they were supposed to protect. And since there was no system to monitor the hospital bypass situation, at one point eighteen hospitals were simultaneously refusing new emergency patients. The city also aggressively used its tremendous public relations apparatus to first deny there was a disaster and then to define the disaster as natural and unpreventable. The city’s public statements about the heat deaths, including the executive summary of a special mayor’s commission, defended the government’s role while obscuring the social roots of the death toll. But the city did learn from its mistakes. In 1999, when Chicago experienced another severe heat wave, the city issued strongly worded warnings and press releases to the media, opened cooling centers and provided free bus transportation to them, phoned elderly residents, and sent police officers and city workers door-to-door to check up on seniors who lived alone. That aggressive response drastically reduced the death toll of the 1999 heat wave: 110 residents died, a fraction of the 1995 level but still catastrophic. The policy lesson is that there are limits to what any emergency plan can accomplish. We know that more heat waves are coming. Every major report on global warming—including the recent White House study—warns that an increase in severe heat waves is likely. The only way to prevent another heat disaster is to address the isolation, poverty, and fear that are prevalent in so many American cities today. Until we do, natural forces that are out of our control will continue to be uncontrollably dangerous. Copyright notice: ©2002 The University of Chicago. All rights reserved. This text may be used and shared in accordance with the fair-use provisions of U.S. copyright law, and it may be archived and redistributed in electronic form, provided that this entire notice, including copyright information, is carried and provided that the University of Chicago Press is notified and no fee is charged for access. Archiving, redistribution, or republication of this text on other terms, in any medium, requires the consent of the University of Chicago Press. 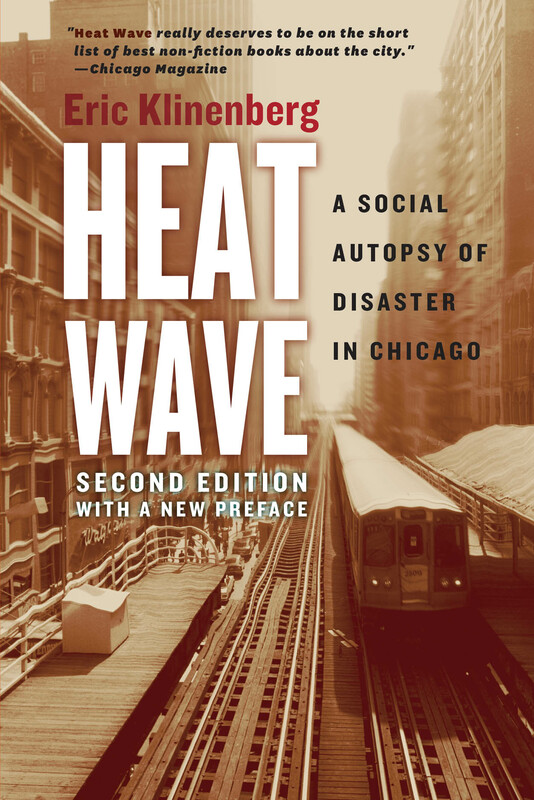 For information on purchasing the book—from bookstores or here online—please go to the webpage for Heat Wave.